If I do say so myself, I’d say that we live in the most extravagant times that can top the the pre-war European societies or the 20’s in a whole other way. People may complain that they want the elegance and the works of simpler times where, they say, everything you possessed was hard-earned and worked for. The simpler times, the times without the richness and overwhelming companion called the Internet may look morally fair but they had some serious racist principles that may frighten you. Principles that were weak and certainly not for everyone and if they still ran on people’s minds today, it would be wrong and shameful. People today think of principles and thoughts that make certain people that are different more comfortable in way that makes you think that they are loved. In other words, people today are kinder than they were fifty years ago or even a decade ago. Love is good, especially for children who just discovered the world and it’s characteristics. Children who are full of love and hope in their hearts. Certain individuals try to spread this love by making animated movies who fight against the erroneous stereotype that still exists in some movies, literature and other art. This growth in diversity in race could possibly be a product of a generation that is exposed to a vast sea of information that is the Internet. The Internet is a breeding ground for opinions of many people and possibly this generation believes that it is a time for these principles to die. Below are movies that have and are hopefully going to break racism into a thousand pieces one step at a time. The creators of Big Hero 6 present characters that are multi-racial intelligent people in action. The story is set in San Fransokyo, a fictional city the mashes up San Francisco and Tokyo. According to one of the directors, Don Hall, they wanted to portray our diverse world and it inspired them to make the one of a kind characters. 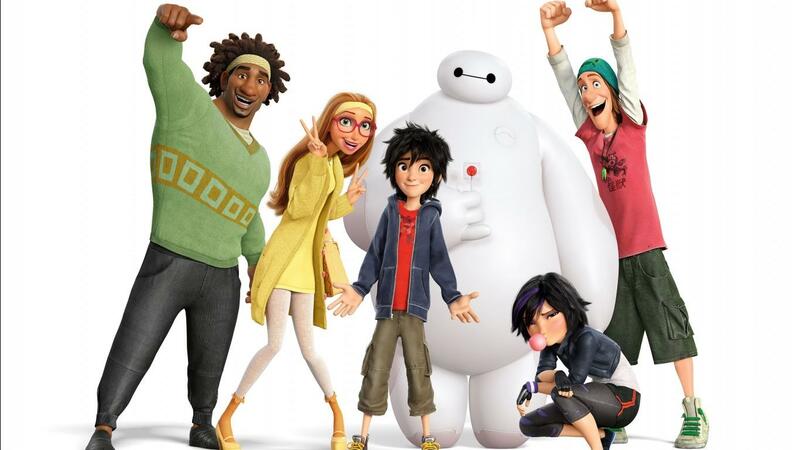 Some people might just call Big Hero 6 the most diverse animated film in all of history. Who can blame them?. The reason for this is because the two main protagonists, Hiro and Tadashi: who are Japanese-Caucasian. The other characters like Honey Lemon who is Hispanic, Gogo Tomago who is of Asian descent, Wasabi who is African-American and Fred who is an Caucasian. The women in the movie are strong and courageous and not the usual ones that Hollywood always tries to portray. Some part in the movie Gogo says something like, “Women up!” How awesome is that? How many superheroes in movies do you know that are people of color? How many superheroes in moves do you know that are women of color? Also, this shows that an ideal modern city like San Fransokyo is a melting pot of cultures, just as realistic as San Francisco. The other diverse film is Bilal, a movie about an Ethiopian boy who converted to Islam and joined with the Prophet Muhammad. The movie is sparked by events from a true hero, Bilal ibn Rabah, one of Muhammad's most trusted companions. He was a born unto slavery but was freed due to Muhammad's view on slavery. In this age, there are conflicts between religions and especially with the radical Muslims who fight with their own way. A lot of people end up stereotyping the religion and the people, connecting them to violence. Children who are Muslim get a chance to watch their hero in the big screen which they were always just told about or read about. This can serve as an inspiration for them for they too can become prophets of peace and love. Below are some screencaps from the trailer. Look at that animation! Another Disney movie called, Moana, that has Dwayne The Rock Johnson as the voice of the protagonist and comes out at 2016. The movie is set in the South Seas around Oceania, and is a fable from the island of Maui. According to Variety Magazine, "In the ancient South Pacific world of Oceania, Moana sets sail in search of a fabled island, and teams with her hero, the legendary demi-god Maui, she encounters enormous sea creatures, underworlds and ancient folklore." This is quite similar to Lilo and Stitch because both protagonists are Polynesian descent. However, they are set in two different places so they must have two different cultures. After Big Hero 6, it looks like Disney is now opening their studios to portray movies about different cultures and settings in their films. Below is a concept art of the film. Here have a short clip of a singing volcano released by Disney! Thanks to the internet, where we all gather together and express our minds about what looks wrong and what looks right. We are in the age of information. We think for the the improvement of our kind. Diversity is the key to opening your mind to new possibilities of ethereal happiness that everyone deserves. Animated movies, which before, may probably be stamped as ‘for kids’. But today, they are da bomb with their graphics and their stories for all ages. Since animated movies, film and others types of media are Western-centered, it would only be natural for them to feature white people and therefor had been the tradition ever since. It would be more da bomb-er with animated movies that represent other races.